Want to free yourself from the spiraling cost and complexity of your current IT infrastructure? Riverbed can help by giving you three key strategies for delivering cloud services with LAN-like performance to end users and IT managers alike. 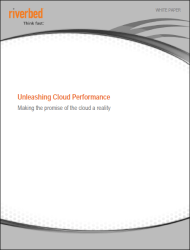 In this whitepaper, we explore how WAN optimization from Riverbed can break the cloud performance barrier and deliver on the promise of accelerated cloud performance for widely distributed enterprises.